Think back to your youth for a moment. Do you recall an abundance of pumpkin recipes? I really only remember pumpkin pie and the occasional pumpkin roll, but these days, it’s wall to wall pumpkin and I’m totally okay with that! 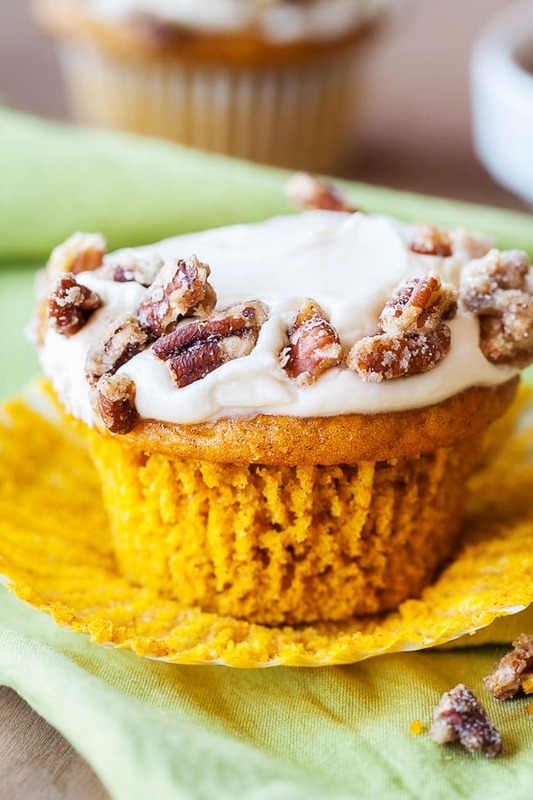 Take these spiced pumpkin cupcakes with candied pecans, for instance. 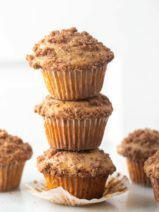 Since computers aren’t sophisticated enough to allow you to reach in and grab a bite yet, you’ll just have to trust me when I say that these delicious little pumpkin jewels are practically perfect. They’re even decked out with a little halo made of candied pecans! I could eat candied pecans all day, every day, by the way. 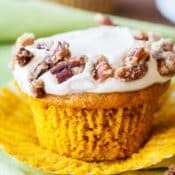 These pumpkin spiced cupcakes only included a little sprinkle of nuts on each one, and that sweet crunch really adds something special. Of course, if you’re not a fan of nuts you can totally leave them out and just enjoy the luscious cream cheese frosting on top. 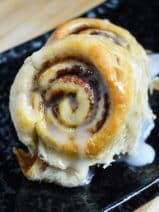 The funny thing about running a food blog is that you tend to make the same recipes over and over again. I actually already have an incredible pumpkin cupcakes recipe in my archives, but I really wanted to share this new spin with all of you. 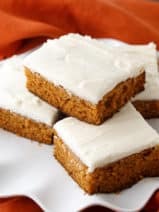 This recipe utilizes a cake mix which is great for times when you need to whip-up an incredible pumpkin dessert but don’t have a lot of time. If you’re a fan of cake mix desserts don’t miss my incredible cake mix cookie bars. It’s a very popular post every holiday season. 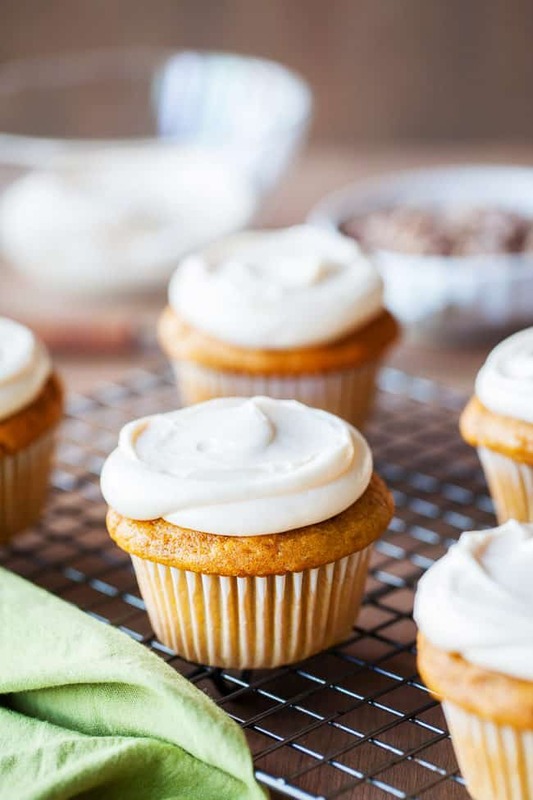 You definitely don’t want to let this yummy spiced pumpkin cupcakes recipe pass you by—it’s a keeper! Preheat oven to 350°F. Line a muffin pan with baking cups. In a nonstick skillet, cook pecans with 2 tablespoons of sugar over low heat, stirring continuously until sugar is melted, for about 5-8 minutes. Be careful not to burn your pecans as this happens quickly. Spoon the pecan mixture onto a sheet of waxed paper to cool. Sprinkle with a bit more sugar and toss to coat. In a large bowl beat cake mix, pumpkin, water, oil, eggs and pumpkin pie spice until well combined. Divide batter into muffin cups filling about 2/3 full. Bake 19 to 24 minutes or until toothpick comes out clean. Cool completely. 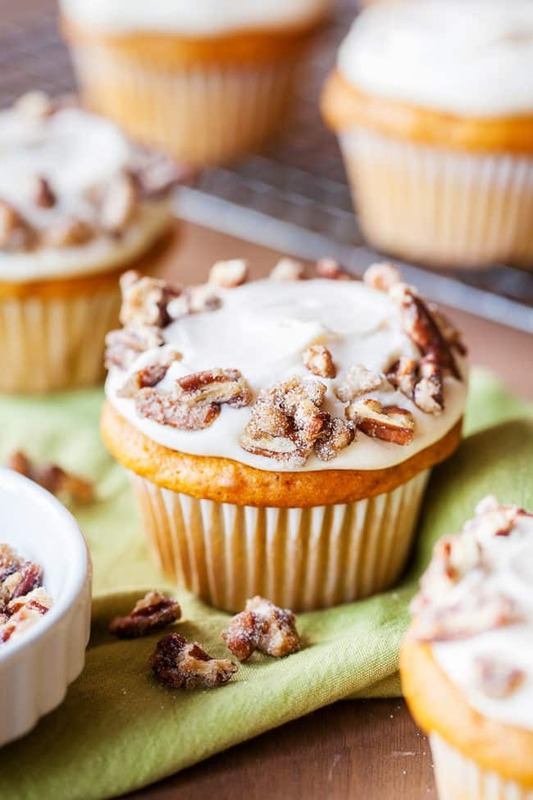 Sprinkle with pecans after frosting. See frosting instructions below! In a large bowl, beat the cream cheese, softened butter, and vanilla. Add powdered sugar until your desired smooth and creamy consistency is reached. Add more powdered sugar if necessary. 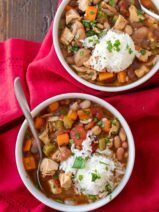 Love the ease of this recipe…but for me it’s really all about those spiced pecans!!! They are beautiful and I love the idea of the flavor and texture they would impart.